OK, on my way back to my car after Famima!! and walking around Old Town, I passed by King Taco. This is one of those Southern California success stories - from Taco truck to many-a-locations around the Los Angeles area. I've been to some of the other King Taco locations but never been in this one. I figured I'd give it a looksee - even though I wasn't really hungry. I got a carne asada and al pastor taco. I enjoyed the al pastor taco more than the carne asada. If you are in the area, found parking, and in need of a quick bite to eat with no frills - this joint is an option. If you've ever travelled in Japan, chances are that you stepped into a Family Mart convenience store. I mean there are like over 12000 stores in Asia! Well, the same company has launched Famima!! stores (FAMIly MArt) in Southern Cali and they introduced one on Raymond in Pasadena just north of Colorado in June 2006. 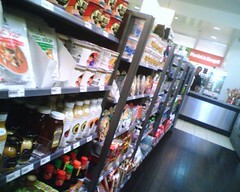 Think of a more sophisticated 7-11 with plenty of Japanese foods, drinks, sweets, and candy to make anyone smile. In typical clean and modern Japanese style, they have many individually wrapped pastries, bundt cake, and cookies. You'll find an assortment of cup noodle alongside stationary. 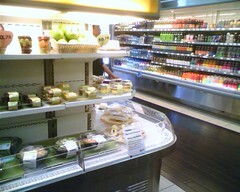 In their refrigerated sections, you'll find prepackaged sandwiches, sushi, hand rolls, bento boxes, various Calpico drinks, creme brulee and some chocolate banana dessert (I didn't try) ...etc. They have Curry donuts, steamed buns, and daily soups. If you had a choice, why would you go to 7-11? 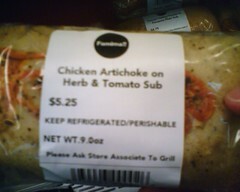 Select a sandwich and take it to the counter and they will panini it on their grill. 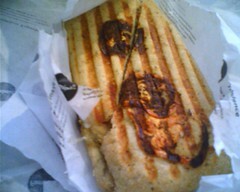 On my particular visit, I tried one of their Chicken Artichoke on Herb and Tomato Sub sandwich and had it panini'd. Below is the outcome. I ate it right in the store while reading the paper. Now let's be realistic, you are not going to find that tear-forming "great sandwich" at some convenient store - but you will get a clean, quick, convenient experience which in itself can be quite satisfying. After all how many times have you gone to some fancier joint only to be disappointed and feel you've overpaid for the lousy experience. Oh and another highlight, no one will criticize you for walking away with that box of Pocky. That's right - I saw you! !